When Kynadi was just two weeks old, doctors became concerned. Kynadi appeared to have Sickle Cell Anemia, an inherited condition in which the body lacks sufficient healthy red blood cells to ensure enough oxygen. Rather than being whole and round, sickle cells shrink and curve like tiny moons—like sickles. But how could Kynadi have Sickle Cell Anemia? 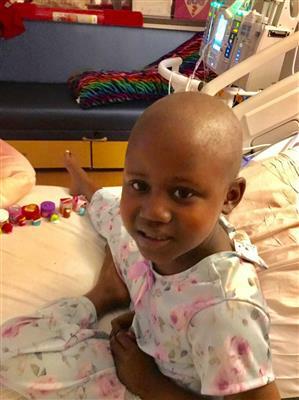 The labs drawn from Kynadi’s mom, Tiffany, said she didn’t carry the trait for Sickle Cell Anemia, and both parents have to be trait carriers in order for a child to have the condition. Had the tests on Kynadi been misinterpreted? Unfortunately, no. Rather, the lab had erred with Tiffany’s report. They finally discovered that she did, in fact, carry the trait for Sickle Cell Anemia. And Kynadi had the disease. For the first several months of Kynadi’s life, monthly appointments to check her hemoglobin constituted the bulk of the differences between her infant life and those of others. But when Kynadi reached nine months, she had her first Sickle Cell attack when she tried to walk but fell down, screaming in pain. Sickle cells were blocking off her blood vessels. From nine months of age until her bone marrow transplant at age six, Kynadi endured repeated Sickle Cell Anemia attacks. She couldn’t go to daycare or be around a lot of other children because she caught every bug they had. At age four, the attacks began to hurt the vessels in Kynadi’s brain. She had to undergo brain scans every month or so. Her spleen began to struggle as well. Around that same time, Tiffany became pregnant. “Did you get pregnant intentionally?” doctors asked. They knew that sometimes parents chose to conceive a child after realizing their first child needed a bone marrow transplant because siblings have a higher chance of offering compatible bone marrow than a stranger. But that wasn’t the case. Rather, Tiffany felt conflicted about bringing this surprise of a baby into the world. What if this child had Sickle Cell Anemia as well? The chances of this baby having Sickle Cell Anemia were 25%. The chance of this baby being able to donate healthy bone marrow to Kynadi were 18%. The day Kayson was born, doctors collected core blood. And when he was two years old, they discovered that Kayson was not only a match for Kynadi’s bone marrow, but a 100% match. On January 23, 2019 Kynadi received her brother’s bone marrow. True to form, Kynadi remained the “happiest girl possible,” as Tiffany describes her. Needles struggle to enter Kynadi’s veins, often resulting in multiple sticks for an IV, and Kynadi will smile at the nurses and tell them it’s just fine to poke her again. She rejoices in tiny treats. And she feels like the His Grace Foundation apartment—decorated with unicorns, her favorite—where she and her mom are staying is her own personal castle.